The HP OfficeJet Pro 6979 looks very similar to other OfficeJet printers, belonging to the same series of 6970. The printer is black in design with curved edges and is mostly matte finished. The front panel of the printer is shiny black in colour. Good for printing quality documents, this all-in-one device is particularly used for the business purpose. In addition to printing documents, it can also perform scanning and copying functions which makes it all-in-one in nature. The printer is cost-effective and gives the user an ability to print crisp documents and stunning images at much affordable price. With the advanced printing options, the printer uses high-quality HP OfficeJet Pro 6979 ink cartridges. These cartridges do not void your printer's print warranty as it comes with a 100% quality satisfaction guarantee. The printer offers wireless connectivity which means one can directly print using a smartphone or tablet. It also provides an output at a fast speed as supports Apple AirPrint or Google Cloud Print. The printer also has an ADF (Automatic Document Feeder) which can print multi-page documents at a time with ease. Support Wireless Network Connection, Wi-Fi Direct and USB connection. With the Wireless connectivity option, users get an opportunity to print the documents sitting at any corner. The printer also has a USB connection and support duplex printing. This enables to print the documents at a much faster speed on both sides of the paper simultaneously and reduce the cost of printing too. Ideal for busy office work this all-in-one printer is extremely user-friendly and excellent value for money. What to do if black or coloured ink is not giving expected print results? Step 1: Rough handling of the HP OfficeJet Pro 6979 ink cartridges at the time of installation can cause a print quality problem in the printer. If any print problem occurs with the new ones, you must wait for a few hours to complete the automatic service routine, and then try to print again. Step 2: The printhead may be clogged. You must clean the printhead once in a month to restore the print quality. To clean the printhead using an automated tool from the printer control panel. Papers have both printing and non-printing side. Choose the appropriate side carefully and load the paper with the suitable print side of the paper in the input tray. Generally, the smoother side of the paper is selected for printing and is the "print side". Avoid the use of wrinkled or curled paper. Load only clean, wrinkle-free paper in the paper tray. Step 4: Always replace damaged or dried up HP OfficeJet Pro 6979 ink cartridges as soon as possible to avoid any issues that can damage the ink system. Use the power button and turn off the printer. Avoid leaving the ink cartridges open for a long time. Do not turn off the printer until cartridges are not installed. Step 5: We recommend you to use high-quality ink. Usage of low-quality ink cartridges would not give you the expected print result. If you do not use suitable cartridges, your problem might not be resolved. Step 6: Also, you need to check the estimated ink level to see the status of HP OfficeJet Pro 6979 ink cartridges. If the ink in the cartridge is low, refill it. Q. How is the quality of the ink used in your compatible HP OfficeJet Pro 6979 ink cartridges, considering the low price of your compatible ink cartridges? A. Even though our ink cartridges are way cheaper than their original counterparts, we do not compromise on quality. The ink used in our compatible cartridges are of premium quality that will provide you with outstanding print results. Our customers have been extremely satisfied, and have not faced issues when using our compatible ink cartridges. Q. Is this printer capable of wireless printing? A. Yes, HP OfficeJet Pro 6979 All-in-One printers allow the user to connect to a Wi-Fi network. This enables multiple devices to be connected to the printer at a time, including mobile devices. Make sure that the device you wish to link with the printer is connected to the same Wi-Fi network as the printer. Q. Do you also provide printing paper on your website? A. Yes, we have a wide range of paper that you can use with your printers. Just make sure that your printer is compatible with a certain type of paper, before purchasing it in bulk. You can find our paper products here. Q. What is the page yield of the compatible HP OfficeJet Pro 6979 ink cartridges that are listed on your website? A. 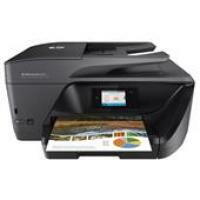 We provide XL ink cartridges for HP OfficeJet Pro 6979 All-in-One printers. In the HP 903XL model, each ink cartridge colour can print up to 830 pages without requiring a replacement. We also provide our customers with the HP 907XL black ink cartridge, which is capable of printing up to 1500 pages. Q. What if the compatible HP OfficeJet Pro 6979 ink cartridges, I ordered, turn out to be faulty? A. All our ink cartridges come with a warranty of 12 months. If you face any problem, please feel free to contact our customer support on 048 30833221. You can also email us your issue on info@printerinkcartridges.ie. Please make sure to provide us with your order details and invoice number so that we can help solve your issue.